Full Service Opening: includes cover removal, de-winterize system, assemble pool and equipment and start filter system, check and balance chemicals as needed to start season. Inspect equipment, and advise customer of needed repairs. Service Call Rates: $105.00 per hr. (1 man), $135.00 per hr. (2 men), 1 hr. minimum. 1/2 hr. increments after min/max is exceeded. EMERGENCY SERVICE: $150.00 per hr. We keep a very tight schedule, and reserve the right to impose a surcharge in emergency situations where your service is bumped in front of another customer's scheduled appointment. Proper closing procedure is vital to the longevity of your pool surface, plumbing and equipment. If you have ever had your pool closed improperly, you know how costly this can be. Schaffer Custom Pool Services strives to provide the most careful and thorough closings available – and at an affordable price. 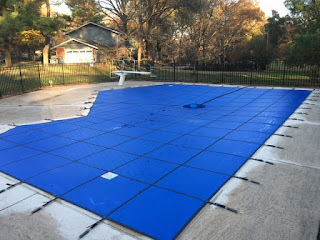 Includes draining the pool down to winterizing levels (below skimmers & returns), blowing out and winterizing plumbing lines and equipment, cleaning pool, applying the winter cover and cover pump and cleaning the filter cartridges and inserts (where applicable). Customer responsible for lowering the water and cleaning the pool of debris prior to arrival and installing the cover after closing. This service package includes blowing out and winterizing plumbing lines and equipment, installing plugs and cleaning the filter cartridges and inserts (where applicable). Application of a winter cover is available for an addition $75. *Additional charge for chemicals, plugs, et cetera needed for proper closing of pool. Includes testing and balancing pool water while closed, inspecting the water level and winterization of equipment & plumbing, routine removal of debris from cover and testing of the cover pump. 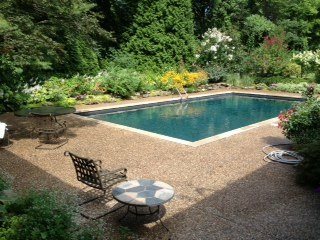 This service is highly recommended for pools that have been recently built or resurfaced (in the last 5 years) as it aids in the proper curing of most pool surfaces – marcite, pebble or quartz-type. Contact us directly for quotes on custom safety covers and/or spa covers. 636-677-4050. "We couldn't be happier with the service we receive from Mike and his team at Schaffer Custom Pool Services! Prior to finding Mike, we were constantly frustrated with the lack of responsiveness from the larger pool companies. But Mike responds personally and promptly to any concern or problem we're having with the pool -- and he makes any needed repairs in a timely manner. Mike has also taken the time to fully explain our equipment and necessary maintenance, and he's flexible about having owners do as much or as little maintenance as they'd like, allowing customers to save money. And for routine service such as pool opening and closing, Mike is very pro-active in scheduling around OUR calendar. We highly recommend Schaffer to all our friends looking for pool service!"